Study To Be Approved | One day all Christian Leaders will be trained and equipped to effectively preach the Gospel in their country. One day all Christian Leaders will be trained and equipped to effectively preach the Gospel in their country. I hope this email finds you well. I am sorry for writing to you so much later after receiving the Kindles but rest assured that the students are truly grateful for your generosity. Many of the students we have come from disadvantaged homes and having the opportunity to learn through a Kindle is just such an exciting opportunity for them( The attached picture somewhat expresses the students joy). We would like to express our sincere gratitude in supporting these students’ education not only in supplying us with the Kindles but also for providing the books for them and responding to our haphazard requests. Thank you so much for your ongoing support, may the Lord Himself richly bless you and your ministry. 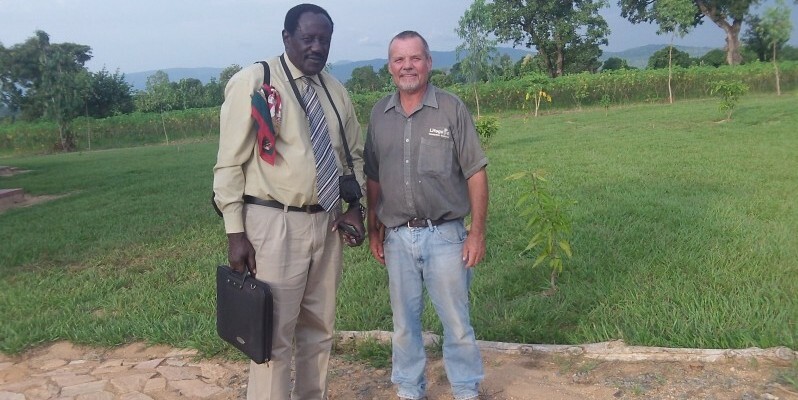 When Jacob Lee of Reaching Africa’s Unreached left for Uganda at the end of March we were able to send 50 Kindles with solar power chargers with him. His plan is to distribute them in the South Sudanese refugee camps. Also, some of the Kindles will be going to Sudan. The Lord is really opening up the mission fields for these Kindles. Kindle fire Jesus film ministry is the practical gospel tools which opens many doors for the gospel to reach unreached areas in the Metu mountains, it is really practically for people, in the recently days after one family saw all the film, on Saturday, and on the next Sunday all the family members came to the church for prayers praise God, this has made the gospel more expanded, in every houses holds,this has made the demands of more discipleship programs needed in the remote areas of metu mountains, besides it is more demanded by the members, because the number of the kindles are few, So our prayers is that God should provide us more for the faithful servants in the metu mountains, with Its mobile solars. Please pray that we will be able to send more Kindles and solar power units to the far reaches of the world so that the Gospel can be spread. A Kindle with solar power unit only costs $100. This is a small cost to reach so many. I spent a week teaching in Ethiopia Dange Balcha. Dange invited me to teach in a Simeon Trust seminar on Expositional Preaching to Ethiopian pastors. What was special about this training is that I was not required to have a translator because all of the men understood and spoke English. This was a great help in teaching. Dagne and I taught lectures on staying on the line, structure, through the cross, melodic line and, text and framework. Each of the men participated in workshops where there analyzed the text and presented to their small group. 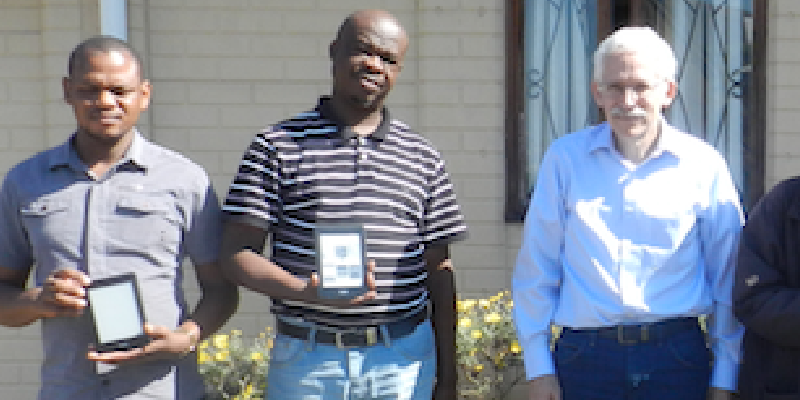 We also provided Kindles to each of the men. These Kindles included English and Amharic books. Also, The Jesus Film in 4 languages in on each Kindle. It is a joy to be able to provide the Kindles to these men. I want to thank the many who purchase Kindles over the Christmas season and donated them. We received around 80 Kindles. These Kindles will be distributed to the far reaches of the world. 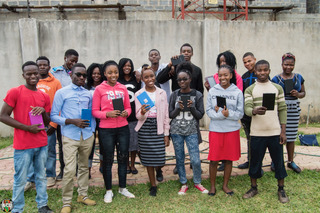 Last week we sent 35 Kindles to African Christian University for their incoming class. The Lord is really blessing the university in Zambia. It is their third year of operation and we have been providing them Kindles for each student. We are getting ready to send 20 Kindles to Ethiopia. These Kindles will be used by indigenous Ethiopian missionaries. These men go to the remote areas of Ethiopia as church planters. Some are in Muslim dominated areas. Please pray for them. Please pray for a potential alliance with Reaching and Teaching. We would like to provide 5 Kindles for every team to distribute to the men they are teaching. This will open up Central America, South America and Asia to ministry. Thank the Lord for a good year. This is the time of the year we focus on giving. The reason for the season is Christ. He came to earth to become a man who lived a perfect life, died a cruel death, was buried and rose again on the third day to give. Yes He went through all of this to give and that gift is forgiveness of sin and eternal life with Him. This gift required a huge investment on the part of Christ. He had to spend 33 years on earth, 3 years in teaching and gave His own life. He set in place forgiveness and gave us a mission to tell the world of this forgiveness in Christ. When we consider investments we look for a return on our investments. We like investments that are small but have huge returns. We want an investment that has a lifetime of dividends. An investment in Study To Be Approved is a wise investments. First the amount invested can be as small as $100 and comes with an eternal dividend. One Kindle Fire with a solar power unit can reach people who never had a chance to hear the gospel. The Kindle Fire can be used to show The Jesus Film to a multitude of people. Your dividend will be the people who come to know Christ because of your investment. Also, you know the money you give goes directly to purchase and prepare Kindles Fires to be sent to impoverished countries to equip pastors and evangelists. Will you make an investment? Think how exciting it will be to meet the many people who trusted Christ as Lord and Savior when you get to heaven because of your investment! So this Christmas make a small investment with an eternal dividend. In the news, we hear about refugees in news all of the time. There are refugees because of natural disasters and political refugees. Because of the civil war in South Sudan, there are currently 1 million people in refugee camps in Uganda. Many of these refugees do not expect to return home for 5 or more years. During the civil war in South Sudan, whole villages were forced flee. There were many villages that had evangelical churches. The congregations and their pastors have fled to Uganda. The pastors of these churches have started working in the refugee camps where they now live. 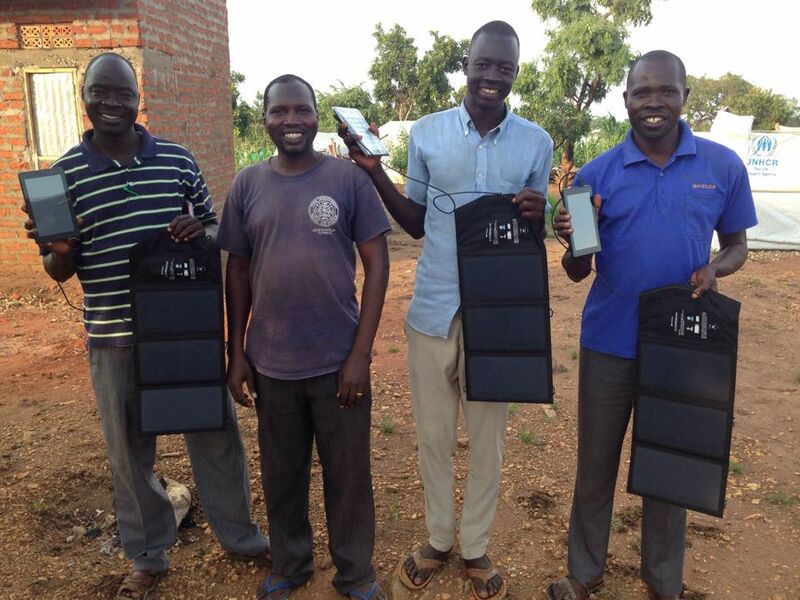 Kindle Fires and portable solar panels for pastors in the nearby Bidibidi refugee camp. Pastor Joshua, second from the left, is our co-worker in the camps who have been delivering RAU materials. Please pray and give so we can equip pastors to care for their congregations and use The Jesus Film to help spread the gospel to unbelievers. After school all the children are coming to ask for kindle fire to see the Jesus film. They love to watch it on the weekends. What a blessing to see children desiring to set the Jesus film. They do not have a overload of entertainment in their culture. Imagine how this film is affecting the rest of their lives. They are being saturated with the Gospel. The Kindle Fires are helping spread the Gospel to the ends of the world. I am in Ethiopia preparing to preach this Sunday and participate in pastor training this week. Every time I go to a African country I am reminded of the unreached millions. I just returned from a walk around my hotel. I see the faces of hundred’s of people who have never heard the Gospel. We were able to bring in 18 Kindle Fires on this trip. These Kindles have Amharic theology books and the Jesus Film in multiple languages. 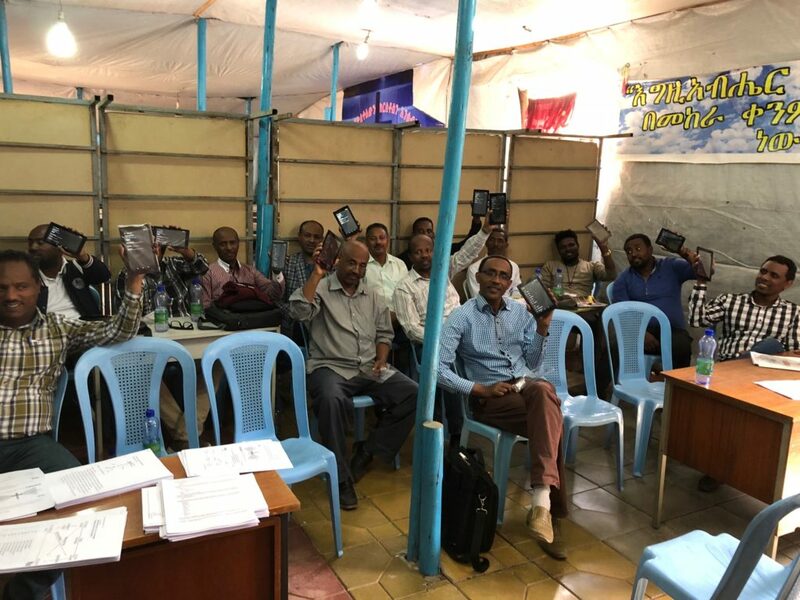 Please pray for the pastors we are training that they will train others and use the Kindles they receive to reach the untold millions in their country. Each pastor coming to the training has made a commitment to train 10 others in the next year. When you consider the world the harvest is truly plentiful. We must pray that the Lord send workers into the field. In the process of sending them we must equipment them. Christ has called us to disciple others so they can reach others and disciple them. This involves teaching them the Word of God so they can teach others. Our ministry has taken on another dimension of equipping those going to the unreached. The Kindle Fires provide good theological books to read and also the ‘Jesus Film’. Every time the ‘Jesus Film’ is shown the worker learns more of the Gospel. Hunter, a young man serving in the Metu Mountains of Uganda, told me how he has learned more about the Gospel when showing the ‘Jesus Film’. He has shown the film so often that he has lost count of how many times he has shown it. The film has help train him in the Gospel. Besides being an excellent evangelism tool www.studytobeapproved.com/givingthat film has been a great training tool. Watch the video of my interview with Hunter. A well equipped worker can do mighty things for God. We need to send more Kindles to the far reaches of the world. Any help you can give will be appreciated. A Kindle Fire with solar charger is $100. Please give to help in this ministry. He is risen! We as believers have know this for years because we have heard the Gospel of our Lord Jesus Christ. But how about the many who have not heard. Below is an quote for an email I received from a pastor working with an unreached people group. The Kindle Fires with the Jesus film and the Open Bible software are great tools to assist the pastors in reaching people in an oral culture. 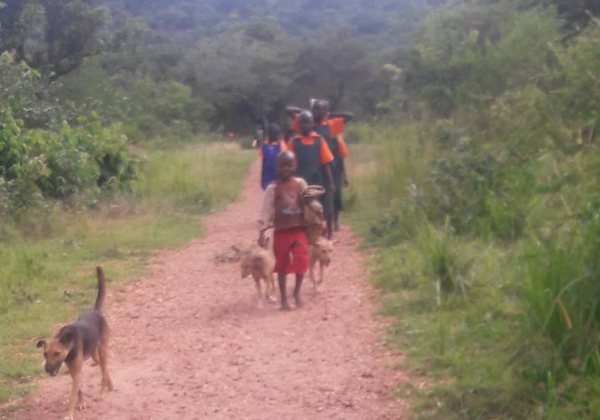 The tribes in the remote areas of Uganda are hearing the Gospel for the first time. They can say “He is Risen!” and rejoice with us.